Thread: Does Inbreeding Cause Weakness? I posted something similair to this on SF and it got deleted because it's a "legal grey area." I'm not convinced that inbreeding creates weakness. Wild animals are more inbreed than we are yet do not suffer from genetic disorders. The only difference I see is that nature trims the weak from the breeding stock. We need to steralize the mentally and phyiscally infirm. This will lead to regeneration. Purity of subracial types can be re-created by means of selective breeding. From this we can have healthy homogeneous subracial nation states. I agree. I fail to see how this falls into a legal grey area though. There is and never will be a law against discussing inbreeding, lol. So people nowadays take this to mean inbreeding is breeding with your own race and outbreeding is breeding with other races. Even some people who call themselves racialists have this idea that if they mix whites and asians they will get some sort of superior race. This is the stupidest thing I've ever heard in my life. It's really quite embarassing to the movement in general. Jeff Goldblum's parents. His mom is on the right. 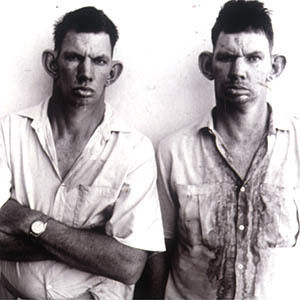 Inbreeding is the source of the monkey-like ears some jews (Jerry and Ben Stiller come to mind) have and the genetic diseases peculiar to them. The data from Lebanon show a significant difference in the incidence of consanguinity between Christians and Muslims (Der Kalustian et al., 1980). However, most Lebanese Christians (Maronites and Armenians) do not identify themselves as Arabs. Clearly, they have different origins and cultural practices. In Jordan, however, consanguinity rates among Christians and Muslims are very similar (Khoury et al., 1992). Besides, the practice is also common among Jews of Arabic origin (Stark et al., 1984). Thus, religion is at least not the single determinant of consanguinity rate. I don't think "inbreeding" has anything to do with these visually unappealing looks. Inbreeding is a relative term, not clearly defined. If you go back far enough, we are all descended from a handful of people who immigrated to Europe thousands of years ago. LOL that's what I thought as well. Men, Do You Cry? / Should Husbands Hide Weakness?